Senior Research Officer, Lynda Donaldson, out looking for godwits, Project Godwit/WWT. 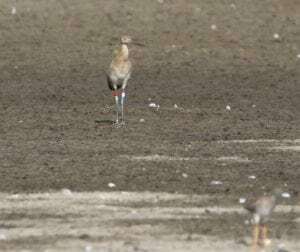 In a similar pattern to 2017, most of the newly released birds were seen around the release site for the first two-three weeks, mingling with other wild black-tailed godwits on site. But it wasn’t long before some of the birds started venturing further afield. Four of the released birds have headed north and joined the large flocks of godwits gathering on the north Norfolk coast. 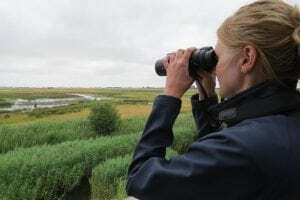 Chip, Rosti, Wedge and Chopstick have all been spotted by birdwatchers at RSPB Titchwell Nature Reserve. Meanwhile, Morgan has headed south and becomes the first of our released birds to be spotted in Hampshire, at Titchfield Nature Reserve. Perhaps he is feeding up before heading south for the winter? Morgan, pictured here in the rearing aviary, has been spotted by birdwatchers in Hampshire, Project Godwit/WWT. 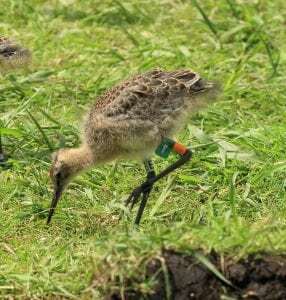 This year our headstarted birds were joined by a very special godwit fledgling from the wild. We now know that nine of the headstarted birds released in 2017 returned to the fens in 2018, which is fantastic news, particularly as most godwits don’t return to breed until they are two years old. But as a welcome surprise, one of these birds, a female named Earith, paired up with a wild bred male and successfully raised a chick of her own. To have evidence that our headstarted birds can breed in the wild is a great milestone for the project. Earith nested at the RSPB Ouse Washes, alongside another wild pair who also fledged three chicks. This is the first time that birds have attempted to breed at this site since 2012, and it’s excellent news that we now have godwits breeding at three different sites in the fens. The first fledged juvenile from a headstarted bird, Jonathan Taylor/RSPB. We’re very grateful to the birding community who have been helping us keep an eye on the birds by sending in their sightings of the godwits. The birds on our project can be distinguished by a lime E colour ring. If you see a bird wearing a lime E colour ring, we’d love to know about it! Sightings can be reported on our sightings page here https://projectgodwit.org.uk/get-involved/report-a-sighting/. We’ve experienced a few technological niggles with our sightings form (for which we apologise) but we hope that this has now been resolved.